With MotionSource you get genuine Trabon MXP divider valves from Graco. The industry standard for quality, reliability, and ease of use features they are synonymous for durability. Trabon MXP divider valves were the original modular-style series progressive divider valve–and customers agree it’s still the best! 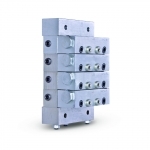 Trabon MXP divider valves use a modular sub plate design, like the smaller MSP valves. The valve section containing the displacement piston is bolted to an individual sub plate. A complete divider valve assembly consists of an inlet section, an end section, and a minimum of three to a maximum of ten stacked sub plates and valve sections. These components are bolted together with three tie rods. The modular design means that outlet connections are made to the sub plate, and valve sections may be changed without disturbing existing tubing. More lubrication points may be added to an existing assembly by installing additional sub plates, valve sections, and outlet tubing. A bypass section is available allowing points of lubrication to be deleted (installing a bypass section) or added (removing an installed bypass section and replacing it with a valve section). The Trabon MXP Series’ greater output volume makes it easy to customize your assembly to meet larger machine requirements. Quick change valve sections can be removed from the base assembly without disturbing any lube lines–minimizing labor cost and maximizing your machine uptime. Can be easily accessorized with magnetic and electronic proximity switch cycle indicators to provide positive assurance of a successful lube event. Alternate outlet on face of valves can be fitted with optional performance indicators, taking the guesswork out of troubleshooting. Built-in outlet check valves ensure accurate lube delivery every time. Choice of SAE, BSPP (ISO 1179), or NPSF inlet and outlet port threads. MXPO base sections (without check valves) are available for circulating oil applications.